How many leisure agents are in your office? How many passengers have you booked this year on escorted tours? Do you promote escorted Group Tours? Do you promote Cruise Tours or River Cruises? What travel agent consortium do you belong to? Collette’s Travel Protection Plan is available for an additional fee and will cover you in the event of illness, accidents, or travel and baggage delay. Payment of a per person Travel Protection Plan fee guarantees a full refund of all payments (including deposit) except for the Travel Protection Plan fee itself, in case of cancellation of travel plans for any reason prior to the day of departure. 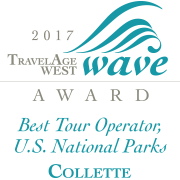 If Collette’s Travel Protection Plan is not purchased, cancellation penalties may apply, when cancellation occurs within 120 days. Travel Protection Plan ranges, based on tour. Call for details.